This post was first published on the Housing & Support Alliance blog. Learning Disability England will bring together three groups: people with learning disabilities, family members and friends, and organisations. We will work on the things that matter to all of us. 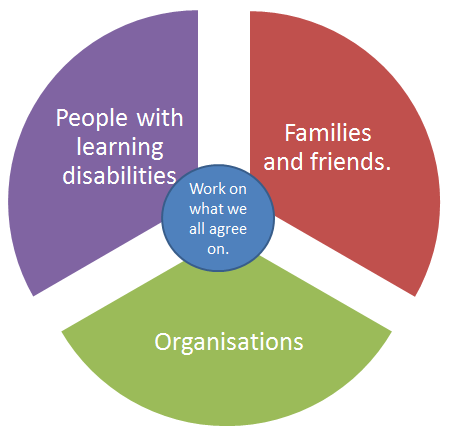 We want to create Learning Disability England because, in the words of self-advocate Gary Bourlet, ‘life for people with learning disabilities in England is not good at the moment’. Currently the voice of people with learning disabilities, family members and organisations is fragmented. We need to link up all the good work that’s happening across the country and create a voice that’s so powerful it cannot be ignored. You can read Gary Bourlet’s thoughts on why we’re creating Learning Disability England here. We’re currently in the middle of a consultation where we’re asking as many people as possible what they want Learning Disability England to be like. We’ve already got feedback from over 300 people. The consultation will close at the end of March so there’s just one month left to tell us what you think! If you’re a person with a learning disability, a family member or friend of someone with a learning disability, or someone who works for an organisation that works with people with learning disabilities then we want to talk to you! You can take part in the consultation by completing an online survey that only takes five minutes. There are three different surveys and you can fill out whichever apply to you. The survey for people with learning disabilities is now closed. The survey for families and friends is now closed. The survey for organisations is now closed. If you’d prefer, you can also take part in the consultation over the phone. You can email Annie at annie.tidbury@housingandsupport.org.uk to arrange a time to speak. Make sure you don’t miss out on the chance to shape this exciting new organisation!